It seems as though everyone from homeowners to state and local governments are refinancing their debt. Refinancing allows the borrower to replace his or her existing debt with a new loan that has a lower interest rate and better conditions. Doing so would allow borrowers to lower their monthly payments, freeing up income for other necessities such as groceries or gas and creating a ripple effect, putting money back into the economy. For former students, however, that is not currently an option. Student-loan debt in the United States now exceeds $1 trillion, and borrowers of color are disproportionately affected. Refinancing is just one option to address the looming student-debt crisis, but for borrowers of color it is one that could significantly ease the student-debt burden that drags on individuals and on our economy as a whole. Today’s average college graduate holds $26,600 in debt when he or she graduates, and the numbers for borrowers of color are more severe. A 2010 study by the College Board Advocacy & Policy Center found that 27 percent of black bachelor’s degree recipients had student-loan debt of $30,500 or more, compared to just 16 percent of their white counterparts. Additionally, 69 percent of black students who did not finish their college degree cite the high cost of tuition, compared to 43 percent of their white peers. These borrowers will be affected for years to come as they attempt to buy homes, open businesses, and begin families. The burden of student debt is one that is carried long after graduation, forcing borrowers to delay homeownership and retirement savings in order to pay off their loans. Since fewer workers now have access to traditional pensions, maintaining long-term savings is crucial to a secure retirement for many Americans. The option to refinance can especially help Latinos, who continue to face an achievement gap. In 2011 only 13.2 percent of all U.S. Latinos over the age of 25 had bachelor’s degrees, compared to 31.8 percent of their white peers. A 2009 Pew Hispanic Center survey found that the most common reason for this gap was pressure to support their families financially, which forces many Latinos to choose between attending college and caring for their families. Low-interest-rate loans would therefore help open doors for Latinos to be able to go to college without having to make that difficult choice. According to our calculation, refinancing student loans would save borrowers roughly $14 billion in 2013 alone, creating a boost of about $21 billion for the nation’s economy. For borrowers of color who face higher interest rates from private loans, refinancing is a vital option to reducing their student debt. If a student with $30,000 of student-loan debt, for example, were allowed to refinance his or her loan and reduce the interest rate on it from 6.8 percent to 3 percent for repayment over 10 years, he or she could save $6,667.05 in interest payments over the life of the loan. The burden of student debt on borrowers of color puts communities of color at a disadvantage when compared to their white peers and exacerbates pre-existing socioeconomic inequalities. About 20 million Americans attend college each year, and about 60 percent use loans to help offset the costs. 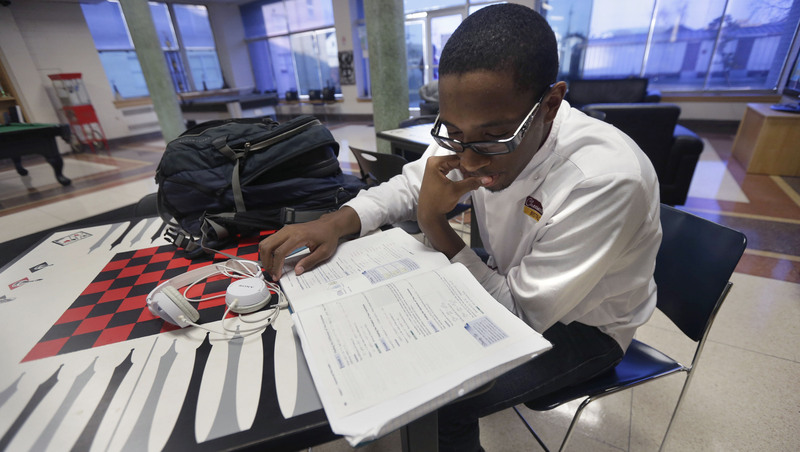 About 81 percent of black students borrow money, compared to 65 percent of their white peers. The impact of student debt on borrowers of color is twofold: Students of color tend to borrow more, and when they do borrow, they often face higher interest rates than their white counterparts. Coupled with lower graduation rates and higher levels of youth unemployment, borrowers of color face unique burdens. Students of color take out private student loans at a higher rate than white students, making them more financially vulnerable to risky interest rates. Private-loan distribution trends differ by students’ race or ethnicity, meaning that students of color take out more risky unregulated private student loans. In 2008 black students had the highest private student-loan participation rate despite the fact that only four years earlier, they had a smaller percentage than both white and Latino students. Mounting levels of high interest rates on student loans leave borrowers of color struggling to make payments on time, often resulting in unforeseen fees for deferment or forbearance—processes that can prevent or delay loan payments. Though these processes may make it easier month to month for borrowers of color, they also make loans more expensive in the long term once tacked onto the increasing interest rates that may have accrued. Students of color are also more likely to enroll in for-profit schools—the payments for which currently account for nearly half of student-loan defaults. For-profit colleges and universities tend to have higher tuitions, higher dropout rates, and higher occurrences of insurmountable debt for students. This puts economic and academic barriers on students of color by reducing college affordability and shifting more of the financial burden onto students and away from college institutions. Youth unemployment—defined as the unemployment rate for those ages 16 to 24 years old—is higher among people of color. According to the Bureau of Labor Statistics, in August 2012 youth unemployment was 28.6 percent for blacks and 18.5 percent for Latinos, compared to 14.9 percent for their white counterparts. Given this high youth unemployment, more young people are realizing that leaving the labor force to go to school has never been a better option. But once they graduate and are faced with significant student debt—often from predatory financial institutions offering high-interest loans to students—they are faced with a double whammy: a lot of debt and a staggering economy. More than 13 percent of the students whose loans came due in 2009 defaulted within three years as a result of their long-term failure to make payments. Since borrowers of color tend to take out more money at a higher interest rate to finance their college expenses and have higher rates of unemployment, it is no surprise that students of color have higher default rates as well. The long-term impact of student debt is crippling, hindering youth and inevitably preventing future generations from home ownership and a secure retirement. Debt not only holds individuals back, it also holds back their families, communities, and the economy at large. Past-due payments on loans lead to plummeting credit ratings, lower wages, and loss of federal benefits such as tax refunds that offset loan debt. Borrowers are losing money out of their own pockets, using more of their income to pay back their student-loan debt instead of saving to buy a home or for retirement. This causes a ripple effect throughout the economy: If fewer people have money to spend throughout the greater economy, less growth will occur and industries will stagnate. One example of this is in the housing market. First-time homebuyers are essential to the recovery of the housing market. According to the Federal Reserve, however, fewer young people are getting mortgages. Only 9 percent of 29- to 34-year-olds got a first-time mortgage from 2009 to 2011, compared to 17 percent in 2001. For those with significant student debt, the debt-to-income ratio puts homeownership out of reach. Additionally, young people who are swimming in education-loan debt are less likely to participate in wealth building mechanisms such as 401(k)s and other retirement savings plans. Refinancing their student debt would give students of color the opportunity to save more over their lifetime, allowing them to spend more on long-term savings and leading to wealth accumulation. In fact, the wealth gap among communities of color and their white counterparts is astonishing. In 2007, the latest year for which data are available, the median wealth for married or cohabitating white non-Hispanic couples was $167,500, compared to $31,500 for blacks and $18,000 for Latinos. The numbers are bleaker for single women: White single women have a median wealth of $41,500, compared to $100 for single black women and $120 for single Latino women. Asset and wealth building occurs over generations, providing communities with economic stability. When barriers such as significant debt hinder young people from saving and building wealth, it can have a long-term effect on their children and grandchildren. In fact, from 1999 to 2007 the Urban Institute estimates that the median net worth of black families was $18,181 and that it was $33,619 for Latino families, compared to $122,927 for whites. These gaps stem from lower asset holding over generations for communities of color. Long-term loan debt puts entire communities at risk, especially those of color, who have historically faced higher levels of unemployment and barriers to achieving wealth over time. While programs for refinancing student debt are just one of many options to address our nation’s student-loan crisis, the need for reasonable interest rates is crucial for borrowers of color. Sophia Kerby is a Research Assistant for Progress 2050 at the Center for American Progress.